Who knew frugality could be so much fun? Australians are amongst the wealthiest people on the planet, but for some reason we don't like to think or talk about money. Once upon a time, thrift and frugality were celebrated as virtues - not anymore. When did 'frugal' become such a dirty word? It's time to reclaim it! When you respect and understand money, it almost magically transforms itself into something that grows exponentially. In The Joyful Frugalista, Money Magazine's Serina Bird shares myriad practical tips for saving money in small ways every day for a better, brighter future. Discover inside: - Ideas and resources for saving on everything from energy bills to weddings, clothing and eating out -Clever ways to cut down your waste -Tips for embracing the joy of minimalism -Ways to wring every drop of pleasure from the money you have -Challenges to help you live life better, including how to feed your family well on $50 per week. 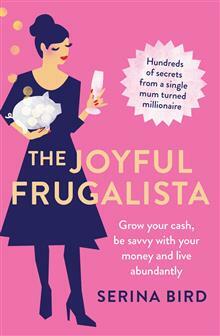 The Joyful Frugalista is the essential handbook to living frugally, mindfully and with real joy on any budget. Serina Bird is an Australian public servant and mother of two who blogs as Ms Frugal Ears. Her advice and experiences at the coalface of budgeting and investing have appeared in the Sun-Herald, Money Magazine and News.com.